This document deals with the formulas of the Exposure Time Calculator (ETC) for LBC. The ETC is organized in three panels: the main upper panel summarizes the input parameters, which should be necessary filled by the common user. The second (left) panel operates with the Total Exposure Time, the Signal to Noise ratio and the Magnitude of a given object. The third (right) panel operates with the Single Exposure Time, the number of exposures, the background and the magnitude of saturation. The input parameters are: the filter, the seeing, the photometric aperture, the morphology of the source, the airmass and the moon phase. The filters available are divided into two main groups: the filters for the Blue Channel of LBC (U, Un, B, V) and those for the Red Channel (V, R, I, Gunn Z, Y). The ETC requires the seeing of the observation and the Photometric Aperture (PA) for the Photometry. The source type can be set to star, elliptical galaxy or spiral galaxy (the half light radius of the galactic sources is 0.4 arcsec). The Signal to Noise ratio is computed for a given PA. It is possible to select also the Airmass and the Moon Phase for the observation. The second panel (left) deals with the computation of the Total Exposure Time (TET), the Signal to Noise Ratio (S/N) and the Magnitude ( ) for a given observation. The third panel (right) deals with the computation of the Single Exposure Time (SET), the Number of exposures ( ), the Background and the Magnitude at which a given exposure is saturated ( ). The two panels are roughly independent. For the TET panel, you need to fix two parameters to find the third one. These are the formulas linking the total exposure time, the Magnitude of a source and the Signal to Noise Ratio. First case: given the seeing, the aperture for photometry, the exposure time and the Signal to Noise ratio, you can compute the magnitude of a source in the given aperture and the total magnitude, given the aperture correction. is the magnitude at a given in an aperture , whereas is the total magnitude of the object. Description: given the seeing , the pixel size of LBC and the aperture in arcsec , the ETC program computes the ratio between the aperture and the seeing. Then it computes the area in pixel for this aperture. The next step is to compute the background in ADU for the single pixel, given the total exposure time , the Magnitude of the Sky , the Zero point at . At the end one computes the magnitude limit at a given Signal to Noise ratio . The magnitude of the sky depends on the Moon day (0,3,7,10,14) and the filter used. It is always computed at airmass=0. It can be read from SKYMAG.dat or from the LBC Database. VIEW THE FILTER FILE LIST (here). The zero point for 1 second of exposure time and for a given airmass can be found in ZEROPNT.dat, where there are the zero points for airmass= 0.0, 1.0, 1.1, 1.2 and so on till 3.0; other values of airmass can be extrapolated. The number of exposures is computed dividing the Total Exposure Time TET by the Single Exposure Time SET for a single exposure. This parameter is taken from the right panel and it is the only parameter calculated by a cross talk of the two panels (TET and SET). At the end one has the magnitude limit for a given filter, moon, exposure time, airmass, seeing, aperture and Signal to Noise Ratio. These formulas compute the magnitude limit in an aperture ! If the object is greater than that aperture, the total magnitude of the object could be brighter. It is computed as a simple formula and displayed in the outputs of the ETC for the panel. Second case: given the seeing , the aperture for photometry , the total exposure time and the total magnitude of an object , you can compute the Signal to Noise Ratio . This result depends on the type of the source: star, elliptical galaxy or spiral. Description: given the seeing and the aperture , first compute the sky brightness and the area using the above formulas. Then compute , the ratio of the aperture and seeing. 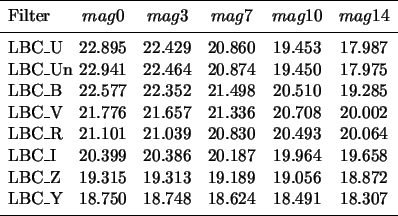 For a stellar source, find in the file totcorr_star.dat the row corresponding to ; the second column gives , the correction for a given aperture. For an elliptical galaxy, find in the file totcorr_ell.dat the row corresponding to ; for a spiral galaxy, the corresponding file is totcorr_spi.dat. Search in the column corresponding to the seeing the correction , for a given aperture and a given seeing. Then correct the input magnitude for , compute the flux in ADU for the given source and compute the Signal to Noise ratio . These formulas compute the Signal to Noise ratio in an aperture . The term provides the contribution of the flat field accuracy to the Noise of a given exposure. It depends on the number of exposures ( ). Warning: This is the reference formula for the ETC: the first and the third cases of this panel (TET) are derived inverting this formula. To enhance the Signal to Noise Ratio it is possible to act on the total exposure time and/or on the number of exposures . Third case: given the seeing , the aperture for photometry , the Signal to Noise ratio and the magnitude of an object , you can compute the exposure time required to reach in the given aperture. This result depends on the type of the source: star, elliptical galaxy or spiral. Description: given the seeing and the aperture for photometry, compute the ratio between and . Compute the area of the aperture and the correction for a given aperture . Then correct the input magnitude of the source for the value, compute the flux of the source for an exposure time of 1 second and for the sky background. Then compute the total time needed to reach a given Signal to Noise ratio in an aperture . Warning: The coefficient must be a positive number. If it is negative or null, no solution can be reached. In this case it is useful to increase the Magnitude of the source or the number of exposures . In the same way, it is possible to decrease the given Signal to Noise to reach convergence in the calculations. These formulas link the Single Exposure Time (SET), the number of exposures, the Background and the Magnitude Saturation (Magnitude of a star that saturates in a single exposure). Only one parameter is needed to obtain the others. Given the single exposure time , compute the number of exposures , the background and the magnitude at saturation for a single exposure. is the maximum of the Moffat profile for total flux . Description: the number of exposures is the ratio between the Total Exposure Time and the Single Exposure Time . It should be an integer number, so it is possible that the product is substantially different from . In this case a simple Warning is given. Given the seeing of the observation , and assuming a Moffat profile, one computes the maximum of the profile for an object with total flux . Given the Magnitude of the Sky and the Single Exposure Time , the Background is derived. The magnitude at saturation is computed for 65536 ( ) ADU (full well capacity of a single pixel for LBC). The maximum of an image is the sum of the background and the peak of the source , for an exposure time of . Given the total flux required to saturate the frame for a Single Exposure Time (SET), one can compute the flux for 1 second and then derive the Magnitude of Saturation . If the ADUs are greater than 65536 ( ) or equal, the image is saturated and an Error message is given. Warning: check that the Single Exposure Time (SET) is consistent with the Total Exposure Time (TET). It is not possible that SET is greater than TET. If TET is large, verify that the combination of TET and SET gives an adequate number of exposures . Given the number of exposures , compute the Single Exposure Time , the background and the magnitude at saturation for a single exposure. Description: the Single Exposure Time is derived dividing the Total Exposure Time by the number of exposures . Then to derive the Background for a Single Exposure and the Magnitude of Saturation the formulas are the same of the First Case. Warning: check that the number of exposures is consistent with the Total Exposure Time (TET). should be an integer number. If TET is large, verify that the combination of TET and gives an adequate value for the Single Exposure Time SET. Given the Background for a single exposure, compute the Single Exposure Time , the number of exposures and the magnitude at saturation for a single exposure. Description: given the Background for a single exposure, it is possible to compute the Single Exposure Time knowing the background for 1 second of exposure time. The number of exposures is the ratio of TET and SET. The peak of a source at the saturation level is derived using the background . Given the seeing of the observation , and assuming a Moffat profile, one computes from the maximum of the profile the total flux . The magnitude at saturation is computed for 65536 ( ) ADU (full well capacity of a single pixel for LBC). Given the total flux required to saturate the frame for a Single Exposure Time (SET), one can compute the flux for 1 second and then derive the Magnitude of Saturation . If the ADUs are greater than 65536 ( ) or equal, the image is saturated and an Error message is given. Warning: it is not possible to enter a Background greater or equal to 65536 ( ) ADU. If TET is large, verify that the combination of TET and gives an adequate number of exposures . Given the Magnitude at Saturation for a single exposure, compute the Single Exposure Time , the number of exposures and the Background for a single exposure. Description: given the Background for 1 second of exposure and the flux at saturation for 1 second of exposure, it is possible to compute the peak of a source that saturates the CCD. The Single Exposure Time is derived from the flux of the background and the source for 1 second of exposure time. The Background for a single exposure is derived using the Single Exposure Time and the Magnitude of the Sky . Then the number of exposures is derived referring to the Total Exposure Time . If the ADUs are greater than 65536 ( ) or equal, the image is saturated. Warning: if TET is large, verify that the combination of TET and gives an adequate number of exposures . In case of problems with the ETC, contact Stefano Gallozzi (gallozzi@mporzio.astro.it).